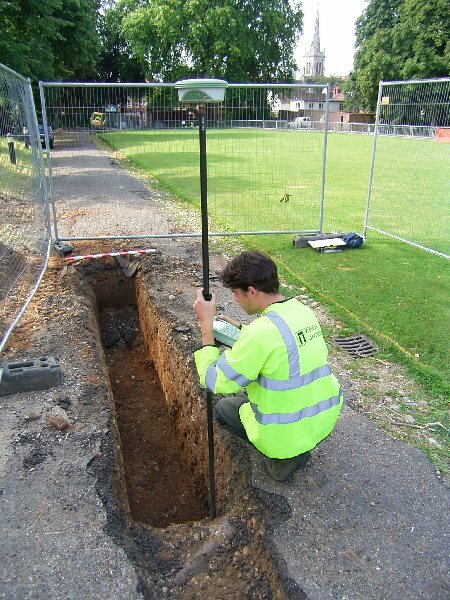 ​​​​​​​During work at Christchurch Park, Ipswich, a medieval cemetery was found. The remains are probably part of the St Margaret’s church burial ground. The burials were found while a new drainage system for the park renovations was being dug. During work at Christchurch Park, Ipswich, a medieval cemetery was found. The remains are probably part of the St Margaret’s church burial ground. The burials were found while a new drainage system for the park renovations was being dug. Archaeologists were watching the pipe trench during construction because it was known that the cemetery, which is at least 500 years old, lay nearby but it was not known exactly where. To protect the burials, the pipe was re-routed across the lawns of the park. Christchurch Park has medieval origins. A priory, or monastery, once stood close to the site of Christchurch Mansion. The priory, known as the Holy Trinity, was founded about 1177 for monks of the Augustinian order. It was a small but wealth priory and people from the town came there to worship. As Ipswich expanded, the priory became overcrowded and around 1300 the priory built the church of St Margaret for the town folk. The church, enlarged over the generations, continues in use today. Like many monasteries and religious houses in England and Wales, Holy Trinity came to grief in the reign of Henry VIII. In 1536 the king decided to close down hundreds of monasteries, and Holy Trinity and its lands were seized. The site of the priory was sold to a wealth merchant who started building Christchurch Mansion as a private home in 1548. Archaeologists record the exact location of some of the burials using a GPS.Paul Falcini of Wessex Archaeology said ‘we were keeping a careful on the new trench and as soon as we found what we thought were graves we stopped the mechanical excavator. We excavated just enough to confirm that human remains were present and then we carefully covered over the graves.’ He added ‘the graves lies close together at regular intervals so it seems that this is a cemetery, most likely part of St Margaret’s. The grounds of the Mansion were extended over part of the churchyard in the 16th century. The renovation works are part of a major project funded by the Heritage Lottery Fund and Ipswich Council to improve the town centre oasis of Christchurch Park.